Most of the fields are self-explanatory.. Here you can link a patient to another existing patient. Type the last name then a comma, then the first name (or part thereof), and press tab. A list of matching names will be shown. Double-click on a name to select that person. You can add a patient picture by clicking the Add button. Address and other contact details can be entered on the Contact details tab. Choose Patient > Show Patients , or click the Show Patients button on the navigator. 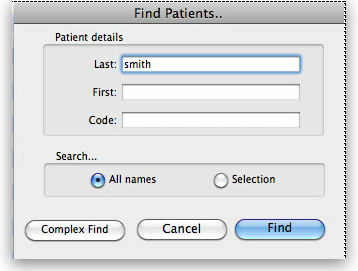 To edit or view a patient’s details, double-click on their name in the list. Type as much of the Last name, First name or Code as you know, and matching patients will be shown. Note that you can search all patients or restrict your search to only those in the already displayed list (the selection). Click on the different tabs to view different details. Note that on the Encounters tab you can double-click on the encounters shown to get their details. You can also select Patient > Admitted to show a list of currently admitted patients.